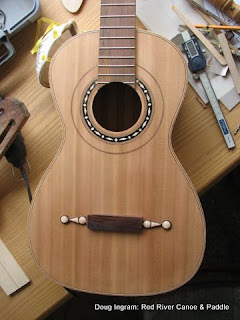 The Panormo guitar now has a bridge made! 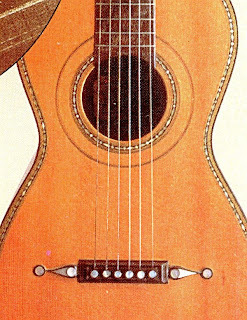 Nylon string guitar bridges pre-Torres, were not the tie-block style that we are familiar with today, but rather used pins like we we see used on steel string guitars. The strings would have used the rim of the bridge as a saddle, I decided to make a saddle that I can adjust, but would still blend in. There is still some final shaping and detail work to do, but its mostly done. 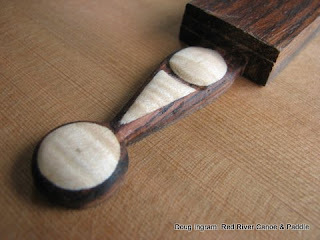 I have some rosewood pins with pearl dots ordered, once they are here I can finish. 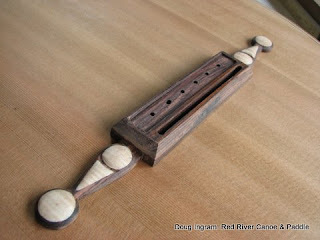 This bridge has not had the final holes drilled yet, these are just pilot holes. The original used pearl for decoration on the wings, I used some figured maple. It will look something like this when it gets glued on.